Sant'Agata increases production from three Aventadors to 4.5 to produce its 1,000th example in just fifteen months. When Lamborghini introduced the Murcielago to replace the aging Diablo after the turn of the millennium, it took the Italian automaker nearly two and a half years to get to its 1,000th example built. But these days - undoubtedly thanks in no small part to its new owners at Audi - the factory in Sant&apos;Agata has gotten more efficient at building its V12 flagship. Today the exotic automaker built its thousandth Aventador. It only took one year and three months to get there, and the supercar&apos;s production is already sold out for the next 18 months. The orange supercar was already bought and paid for, and was handed over right off the production line by Lamborghini CEO Stephan Winkelmann, to its eagerly awaiting buyer Hans Scheidecker. The Aventador, of course, represents the pinnacle of Lamborghini&apos;s technological evolution, replacing the steel-framed Murcielago with an all-new carbon monocoque chassis. 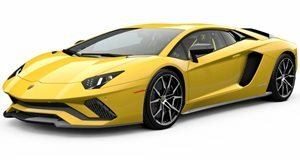 At its center, Lamborghini gave the Aventador an all-new 6.5-liter V12 with 700 metric horsepower driven through a new type of sequential transmission and a Haldex all-wheel drive system for a 0-60 time in less than three seconds and a top speed pegged at 217 mph.